For other uses, see Annunciation (disambiguation). 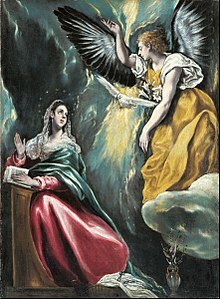 The Annunciation (from Latin annuntiatio), also referred to as the Annunciation to the Blessed Virgin Mary, the Annunciation of Our Lady, or the Annunciation of the Lord, is the Catholic and Eastern Orthodox celebration of the announcement by the Archangel Gabriel to the Blessed Virgin Mary that she would conceive and become the mother of Jesus, the Son of God, marking His Incarnation. Gabriel told Mary to name her son Yeshua, meaning "YHWH is salvation". According to Luke 1:26, the Annunciation occurred "in the sixth month" of Elizabeth's pregnancy with John the Baptist. 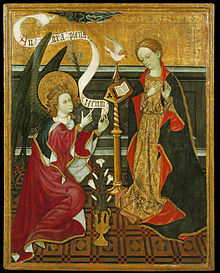 Many Christians observe this event with the Feast of the Annunciation on 25 March, an approximation of the northern vernal equinox nine full months before Christmas, the ceremonial birthday of Jesus. 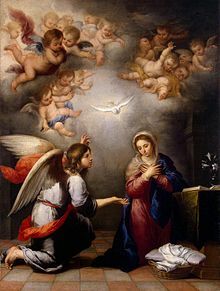 The Annunciation is a key topic in Christian art in general, as well as in Marian art in the Catholic Church, particularly during the Middle Ages and Renaissance. 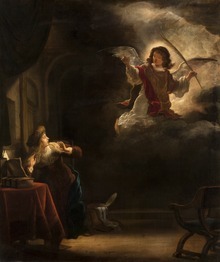 A work of art depicting the Annunciation is sometimes itself called an Annunciation. [X] shall be great upon the earth. O king, all people shall make peace, and all shall serve him. He shall be called the son of the Great God, and by his name shall he be hailed as the Son of God, and they shall call him Son of the Most High. It has been suggested that the similarity in content is such that Luke's version may in some way be dependent on the Qumran text. 45 Behold! the angels said: "O Mary! Allah giveth thee glad tidings of a Word from Him: his name will be Christ Jesus, the son of Mary, held in honour in this world and the Hereafter and of (the company of) those nearest to Allah;"
Sura 019:016 (Maryam – Mary) verses 16–26 also refers to the Annuciation. In the Eastern Orthodox, Eastern Catholic, and Oriental Orthodox Churches, the Feast of the Annunciation is one of the twelve "Great Feasts" of the liturgical year, and is among the eight of them that are counted as "feasts of the Lord". Throughout the Orthodox Church, the feast is celebrated on March 25. In the churches that use the new style Calendar (Revised Julian or Gregorian), this date coincides with March 25 on the civil calendar, while in those churches using the old style Julian calendar, March 25 is reckoned to fall on April 7 on the civil calendar, and will fall on April 8 starting in the year 2100. "Rejoice, O Full of Grace, the Lord is with you!" As the action initiating the Incarnation of Christ, Annunciation has such an important place in Orthodox Christian theology that the festal Divine Liturgy of St. John Chrysostom is always celebrated on the feast, even if it falls on Great and Holy Friday, the day when the crucifixion of Jesus is remembered. Indeed, the Divine Liturgy is celebrated on Great and Holy Friday only when the latter coincides with the feast of the Annunciation. If the Annunciation falls on Pascha (Easter Sunday) itself, a coincidence which is called Kyriopascha, then it is celebrated jointly with the Resurrection, which is the focus of Easter. Due to these and similar rules, the rubrics surrounding the celebration of the feast are the most complex of all in Orthodox Christian liturgics. St Ephraim taught that the date of the conception of Jesus Christ fell on 10 Nisan on the Hebrew calendar, the day in which the passover lamb was selected according to Exodus 12. Some years 10 Nisan falls on March 25, which is the traditional date for the Feast of the Annunciation and is an official holiday in Lebanon. Both the Roman Catholic and Eastern Orthodox Churches hold that the Annunciation took place at Nazareth, but slightly differ as to the precise location. The Basilica of the Annunciation marks the site preferred by the former, while the Greek Orthodox Church of the Annunciation marks that preferred by the latter. Greek Independence Day is celebrated on the feast of the Annunciation and 25 March is also a national holiday in the Lebanon. When the calendar system of Anno Domini was first introduced by Dionysius Exiguus in AD 525, he assigned the beginning of the new year to March 25 since, according to Catholic theology, the era of grace began with the Incarnation of Christ. 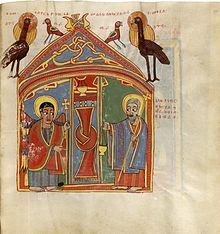 The first certain mentions of the feast are in a canon of the 656 Council of Toledo, where it is described as celebrated throughout the church. The 692 Council of Constantinople "in Trullo" forbade observance of any festivals during Lent, excepting Sunday and the Feast of the Annunciation. An earlier origin had been claimed for it on the grounds that it appeared in manuscripts of the sermons of Athanasius and Gregory Thaumaturgus but they were subsequently discovered to be spurious. Along with Easter, March 25 was used as the New Year's Day in many pre-modern Christian countries. The holiday was moved to January 1 in France by Charles IX's 1564 Edict of Roussillon. In England, the feast of the Annunciation came to be known as Lady Day, and Lady Day marked the beginning of the English new year until 1752. Also in England, the 1240 Synod of Worcester banned all servile work during the Feast of the Annunciation, making it a day of rest. Works on the subject have been created by artists such as Sandro Botticelli, Leonardo da Vinci, Caravaggio, Duccio, Jan van Eyck, and Murillo among others. The mosaics of Pietro Cavallini in Santa Maria in Trastevere in Rome (1291), the frescos of Giotto in the Scrovegni Chapel in Padua (1303), Domenico Ghirlandaio's fresco at the church of Santa Maria Novella in Florence (1486), and Donatello's gilded sculpture at the church of Santa Croce, Florence (1435) are famous examples. 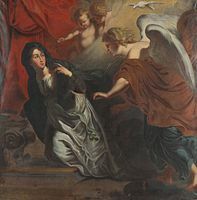 The Annunciation by Paolo de Matteis, 1712, Saint Louis Art Museum, Saint Louis. 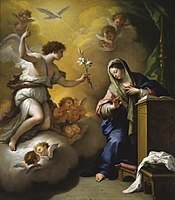 The white lily in the angel's hand is symbolic of Mary's purity[n 2] in Marian art. 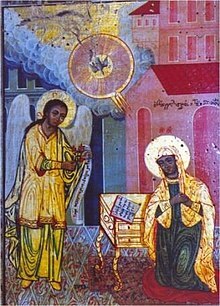 ^ In Eastern Orthodoxy, Mary is referred to as Theotokos (Greek: Θεοτόκος, from Θεο, theo-, "God", and τοκος, tokos, "bearer"). ^ Purity is a wider concept than virginity, which is comprised within it, but which relates to a physical aspect only of purity. ^ "Lessons for Holy Days » The Prayer Book Society of Canada". Prayerbook.ca. 2014-03-23. Retrieved 2014-03-27. ^ a b c d e EB (1878). ^ "Bible Gateway passage: Matthew 1:18-23 - Complete Jewish Bible". Bible Gateway. ^ a b c EB (1911a). Holweck, Frederick George (1907). "Feast of the Annunciation of the Blessed Virgin Mary" . In Herbermann, Charles (ed.). Catholic Encyclopedia. 1. New York: Robert Appleton Company. ^ a b EB (1911b). 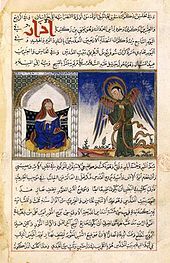 Wikimedia Commons has media related to Annunciation. Wikisource has the text of the 1913 Catholic Encyclopedia article The Annunciation.